It has been well established that organic-inorganic hybrid molecules can exhibit biological activities that are different from those of either their intramolecular metals in inorganic forms or their organic structures. We have previously reported that organoantimony compound Sb-phenyl-N-methyl-5,6,7,12-tetrahydrodibenz[c,f][1,5]azastibocine (PMTAS) is nontoxic, but that the compound exhibits cytotoxicity in vascular endothelial cells when the antimony atom is replaced with a bismuth atom. In the present study, we investigated the cytotoxicity and intracellular accumulation of PMTAS and its analogs and found that the cytotoxicity of PMTAS analogs also decrease depending on the electron-withdrawing property of the substituent bound to the intramolecular antimony atom. On the other hand, with the exception of the phenyl group, and depending on the carbon number of hydrocarbon group bound to the intramolecular nitrogen atom, cytotoxicity was enhanced. Furthermore, the cytotoxicity of PMTAS analogs correlated with their intracellular accumulation values. These results suggested that the low cytotoxicity effects of PMTAS on vascular endothelial cells is due to the characteristics of substituents bound to intramolecular antimony and nitrogen atoms. Organic-inorganic hybrid molecules – organometallic compounds and metal complexes – have long been used as tools for chemical synthesis. However, those molecules have not yet contributed much to developments in the life sciences. Our previous studies suggest that the biological activities of hybrid molecules are completely different from those of either the usual molecular structure or intramolecular metal. For example, in vascular endothelial cells, copper(II) bis(diethyldithiocarbamate) suppresses the synthesis of tissue plasminogen activator, a fibrinolytic protein (Fujie et al., 2017), and potassium tetrachloro(1,10-phenanthroline) rhodate induces the expression of syndecan-4, a transmembrane heparan sulfate proteoglycan (Hara et al., 2017). Biological activities of organic-inorganic hybrid molecules cannot be presumed from the biological activities of the ligand or a particular intramolecular metal. The characteristics of organic-inorganic hybrid molecules in biological activities can provide useful tools for the analysis of biological systems. For example, tris(pentafluorophenyl) stibane induces the metallothionein isoform gene expressions – MT-1A and MT-2A – in bovine vascular endothelial cells (Fujie et al., 2016a) and it has been revealed that the transcriptional induction of both metallothionein isoforms require activation of the metal regulatory transcription factor 1-metal responsive element (MTF1-MRE) pathway, whereas that of MT-1A also requires activation of the NF-E2-related factor 2-antioxidant response element (Nrf2-ARE) pathway (Fujie et al., 2016a). Similar results were obtained when the signaling pathways for metallothionein isoform induction were analyzed using copper(II) bis(diethyldithiocarbamate) as a tool (Fujie et al., 2016b). As a new toxicology research strategy, we have previously called attention to bio-organometallics, which is a field of biology using organic-inorganic hybrid molecules, (Fujie et al., 2016c). Of particular note, our previous study showed that replacing an intramolecular metal atom with another metal atom often results in a marked change in the biological activities of the hybrid molecules (Fujie et al., 2016a; Hara et al., 2016). The cytotoxicity of organic-inorganic hybrid molecules also changes when their intramolecular metal is replaced. For example, an organoantimony compound Sb-phenyl-N-methyl-5,6,7,12-tetrahydrodibenz[c,f][1,5]azastibocine (PMTAS) is nontoxic, but the compound exhibits cytotoxicity in vascular endothelial cells when the antimony atom is replaced with a bismuth atom (Kohri et al., 2015). Accordingly, this study aims to investigate the structure-activity relationship of [1,5]azastibocines cytotoxicity on vascular endothelial cells and clarify the mechanisms from the viewpoint of the structural characteristics by which PMTAS exhibits only very low cytotoxicity when the accumulation within the cells is low. Bovine aortic endothelial cells were purchased from Cell Applications (San Diego, CA, USA). Tissue culture dishes and plates were from AGC Techno Glass (Shizuoka, Japan). Dulbecco’s modified Eagle’s medium (DMEM) and Ca2+- and Mg2+-free phosphate-buffered saline (CMF-PBS) were obtained from Nissui Pharmaceutical (Tokyo, Japan). Fetal bovine serum (FBS) and a bicinchoninic acid (BCA) protein assay kit were purchased from Thermo Fisher Scientific (Waltham, MA, USA). 3-(4,5-Dimethyl-2-thiazolyl)-2,5-diphenyl-2H-tetrazolium bromide (MTT) was purchased from Dojindo Laboratories (Kumamoto, Japan). SbCl3 and other reagents of the highest grade available were obtained from Nacalai Tesque (Kyoto, Japan). Azastibocines were prepared according to the reported procedure or its modified methods (Kakusawa et al., 2006; Kakusawa and Kurita, 2006). The metal exchange reactions of N,N-bis(2-bromobenzyl)-N-substituted amines with n-BuLi, followed by the addition of antimony trihalide (SbX3) resulted in Sb-halo-1,5-azastibocines. Treatment of the obtained compounds with appropriate lithium reagents produced Sb-substituted-1,5- azastibocines. Vascular endothelial cells were cultured in a humidified atmosphere of 5% CO2 at 37°C in DMEM supplemented with 10% FBS until confluent. They were then transferred into 24- or 96-well culture plates and cultured until confluent. The medium was then discarded, and the cells were washed with serum-free DMEM. In the next step, the cells were treated with organoantimony compounds or SbCl3 (0.01, 0.05, 0.1, 0.5, 1, 2, 5, 10, or 20 µM) for 24 hr. After treatment, the cells were used for the following experiments. The organoantimony compounds used in this study and their structures are shown in Table 1 and Fig. 1, respectively. Table 1. Organoantimony compounds used in this study. The structures of organoantimony compounds used in this study. After treatment with organoantimony compounds or SbCl3, the conditioned medium was discarded and the cell layer was washed with CMF-PBS. The cells were then incubated with serum-free DMEM containing with 0.25 mg/mL MTT for 1 hr. The DMEM containing MTT was discarded and the cell layer was first washed with CMF-PBS, and then lysed with 100 µL of dimethyl sulfoxide, after which the absorbance of the lysate at 570 nm was measured as a marker of cell viability. The 50% cytotoxic concentration (CC50) was defined as the concentration where the cell number decreased by 50% and calculated by fitted logit formula using Image J. After treatment with organoantimony compounds or SbCl3, the cell layer was harvested with 60 µL of 50 mM Tris-HCl buffer solution (pH 6.8) containing 2% sodium dodecyl sulfate and 10% glycerol. The cells were then lysed by incubation at 95°C for 10 min and 35 µL of the lysate was incubated at 130°C for 48 hr in 9.6 M nitric acid containing 7.4% hydrogen peroxide. The samples were then dried and dissolved in 4 mL of 0.1 M nitric acid. The content of antimony atom was then analyzed using inductively coupled plasma mass spectrometry (ICP-MS) (Nexion 300S, PerkinElmer, Waltham, MA, USA). The ICP-MS conditions were optimized for a plasma output of 1600 W, a plasma gas flow of 18.0 L/min, and a nebulizer gas flow rate of 0.96 L/min. Another portion of the cell lysate was analyzed for protein content using the BCA protein assay kit to express the content of antimony as pmol/mg protein. 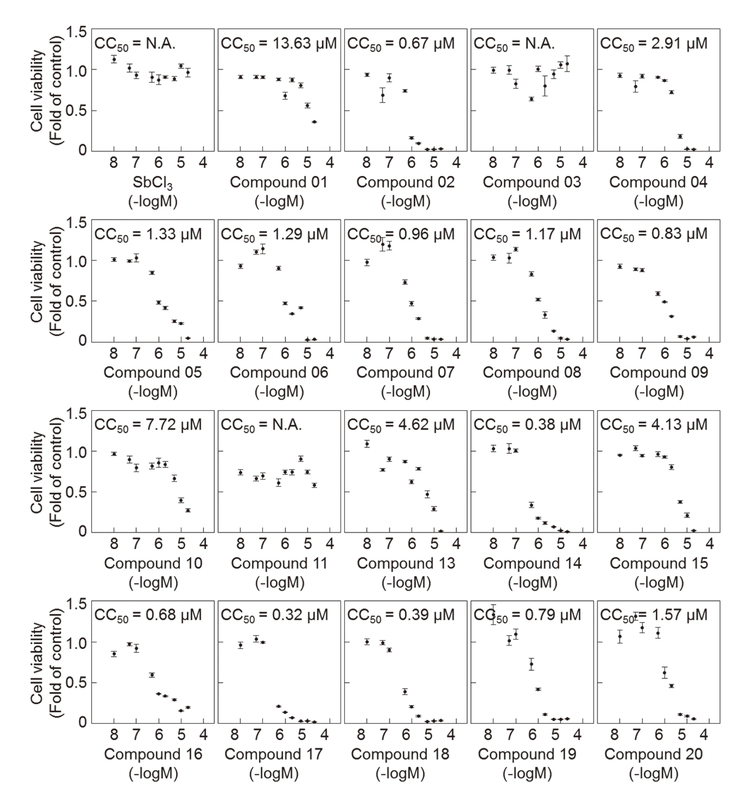 We first investigated whether or not organoantimony compounds are, in general, nontoxic in vascular endothelial cells (Fig. 2). Morphological observations showed that compounds 01, 03, 10, and 11 were nontoxic, while the other compounds were toxic at concentrations of 10 µM. 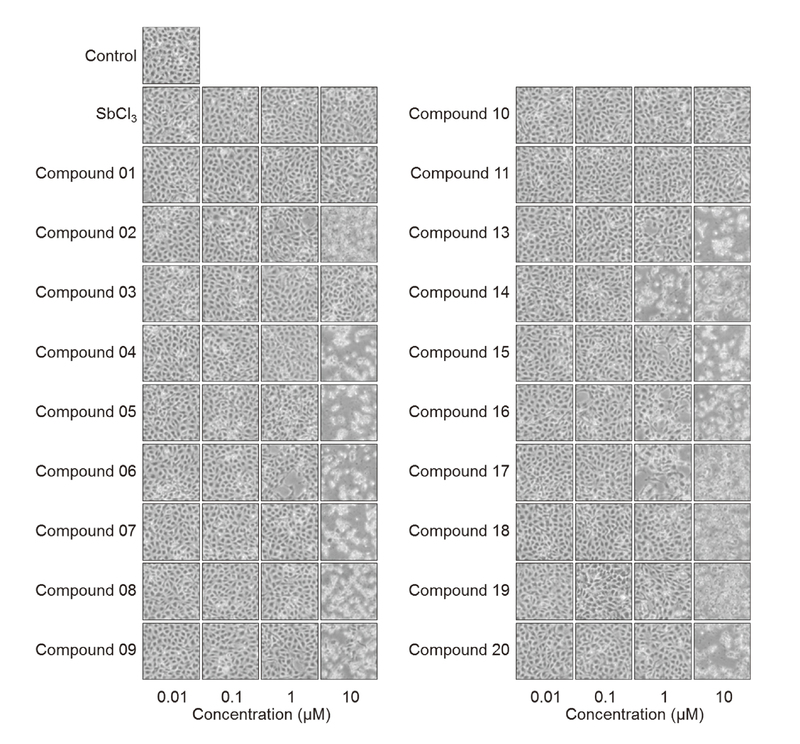 No change was observed in the cells after treatment with SbCl3 at 10 µM and less. Compounds 14 and 17 exhibited cytotoxicity at 1 µM. These results indicated that the cytotoxicity of organoantimony compounds depends on the substituents bound to the [1,5]azastibocine structure. Morphological observations of vascular endothelial cells after exposure to organoantimony compounds. Bovine aortic endothelial cells were treated with organoantimony compounds or SbCl3 at 0.01, 0.1, 1, or 10 µM for 24 hr. In order to quantitatively determine the concentrations sufficient for organoantimony compounds to exhibit cytotoxicity, vascular endothelial cells were exposed to 0.01 to 20 µM and cell viability was measured (Fig. 3). 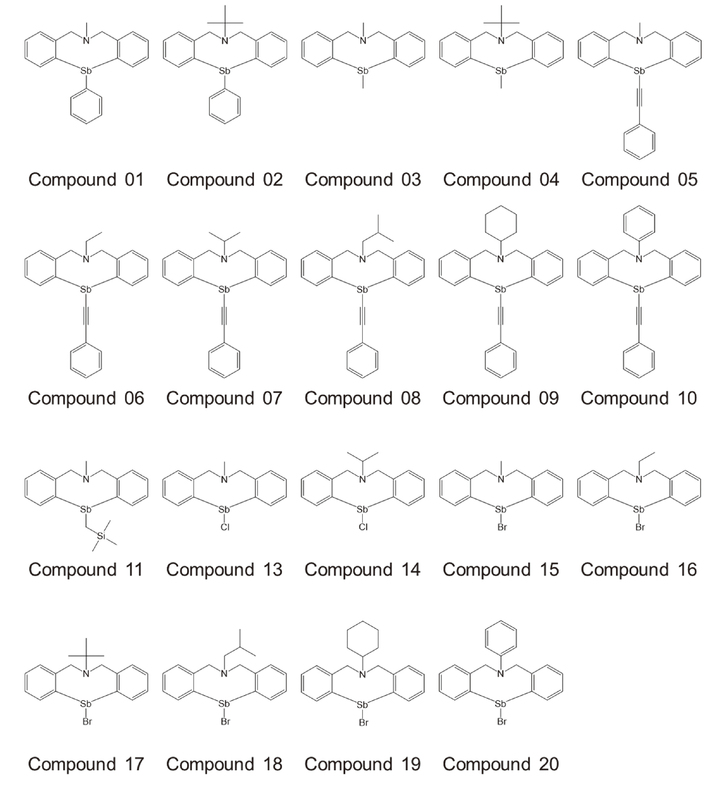 The CC50 value of Compounds 01, 02, 04, 05, 06, 07, 08, 09, 10, 13, 14, 15, 16, 17, 18, 19, and 20 was 13.63, 0.67, 2.91, 1.33, 1.29, 0.96, 1.17, 0.83, 7.72, 4.62, 0.38, 4,13, 0.68, 0.32, 0.39, 0.79, and 1.57, respectively. 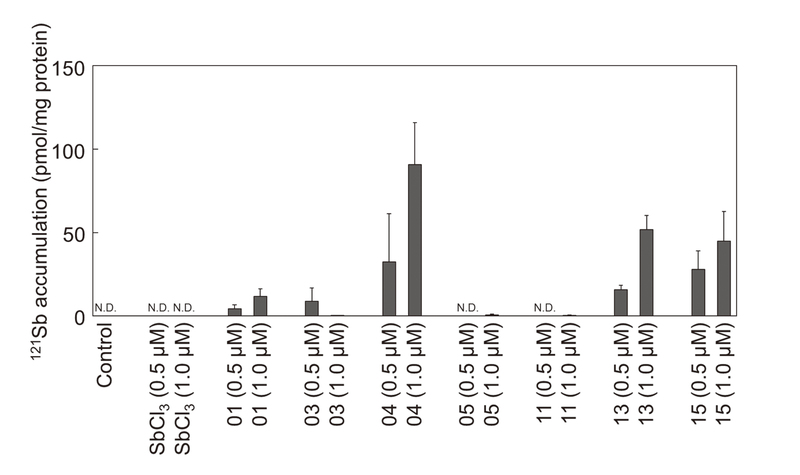 The CC50 could not be analyzed in the same concentration range in SbCl3 and Compounds 03 and 11 because those compounds did not morphologically exhibit cytotoxicity at 10 µM (as shown in Fig. 2) and the CC50 values were at 20 µM and more. In addition to the morphological observations shown in Fig. 2, the CC50 experiment results (Fig. 3) suggest the following mechanisms from the viewpoint of structural characterization: (1) The substituents bound to the intramolecular antimony atom affected the strength of cytotoxicity and the order of intensity was halogen group ≥ phenylethynyl group > phenyl group > methyl group. This order correlated with the strength of the electron-withdrawing property. (2) The cytotoxicity became higher in correlation with the increase in the carbon number of the alkyl group bound to intramolecular nitrogen atom. The phenyl group was an exception. We postulate that the three-dimensional (3D) change caused by the hydrocarbon group bound to intramolecular nitrogen atom is also directly related to the cytotoxicity of [1,5]azastibocines in vascular endothelial cells. Figure 4 shows the accumulation of the [1,5]azastibocine compounds with methyl group(s) in their structures (Compounds 01, 03, 04, 05, 11, 13, and 15) and SbCl3 within vascular endothelial cells. As can be seen in the figure, accumulations of Compounds 01, 03, and 11 as well as SbCl3 were extremely small, which is consistent with their lower cytotoxicity (Figs. 2 and 3). However, it should be noted that even though the accumulation of Compound 05 within the cells was low, a decrease in cell viability was found at around 1 µM (Fig. 3). This suggests that this compound may transduce the signal leading to a decrease in cell viability by interacting with some death receptors (Schulze-Osthoff et al., 1998). We also found that Compounds 04, 13, and 15 accumulated within vascular endothelial cells in a dose-dependent manner and that the intracellular antimony accumulation correlated with the cytotoxicity strength shown in Fig. 3, which suggests that the cytotoxicity of these compounds depends on their intracellular accumulation. The intracellular accumulation of PMTAS (Compound 01) was also dose-dependent, but the accumulation was lower than that of Compounds 04, 13, and 15, again suggesting that the lower cytotoxicity of PMTAS to vascular endothelial cells is due to its lower intracellular accumulation (Kohri et al., 2015). From the viewpoint of structural characteristics, the present data indicate that the lower cytotoxicity of PMTAS to vascular endothelial cells is based on both the bound of the methyl group to the intramolecular nitrogen atom (which results in lower exhibited cytotoxicity), and the phenyl group bound to the intramolecular antimony atom (that reduces the intracellular accumulation). Taken together, the results of the present study reveal that PMTAS is a unique [1,5]azastibocine compound that exhibits both low cytotoxicity and intracellular accumulation because of its structural characteristics. This work was supported by the Japan Society for the Promotion of Science (JSPS) KAKENHI Grant Numbers JP15K14992 (to T.K.) and JP15K08047 (to C.Y.). Fujie, T., Okino, S., Yoshida, E., Yamamoto, C., Naka, H. and Kaji, T. (2017): Copper diethyldithiocarbamate as an inhibitor of tissue plasminogen activator synthesis in cultured human coronary endothelial cells. J. Toxicol. Sci., 42, 553-558. Fujie, T., Murakami, M., Yoshida, E., Yasuike, S., Kimura, T., Fujiwara, Y., Yamamoto, C. and Kaji, T. (2016a): Transcriptional induction of metallothionein by tris(pentafluorophenyl)stibane in cultured bovine aortic endothelial cells. Int. J. Mol. Sci., 17, 1381. Fujie, T., Hara, T. and Kaji, T. (2016c): Toxicology of organic-inorganic hybrid molecules: bio-organometallics and its toxicology. J. Toxicol. Sci., 41 (Special), SP81-SP88. Hara, T., Matsuzaki, H., Nakamura, T., Yoshida, E., Ohkubo, T., Maruyama, H., Yamamoto, C., Saito, S. and Kaji, T. (2016): Cytotoxicity of zinc, copper and rhodium complexes with 1, 10-phenanthroline or 2, 9-dimethyl-1, 10-phenanthroline in cultured vascular endothelial cells. Fundam. Toxicol. Sci., 3, 109-113. Kakusawa, N., Tobiyasu, T., Yasuike, S., Yamaguchi, K., Seki, H. and Kurita, J. (2006): Hypervalent organoantimony compounds 12-ethynyl-tetrahydrodibenz[c,f][1,5]azastibocines: highly efficient new transmetallating agent for organic halides. J. Organomet. Chem., 691, 2953-2968. Kakusawa, N. and Kurita, J. (2006): Hypervalent organoantimony compound 12-aryl-tetrahydrodibenz[c,f][1,5]azastibocine: new transmetalating agent for palladium-catalyzed arylation of organic halides. Heterocycles, 68, 1335-1348. Schulze-Osthoff, K., Ferrari, D., Los, M., Wesselborg, S. and Peter, M.E. (1998): Apoptosis signaling by death receptors. Eur. J. Biochem., 254, 439-459.